Today, the average consumer moves between devices up to 27 times an hour and uses three or more different devices to complete a task. That’s a lot of devices and movement, which presents a significant challenge for marketers: how can we measure cross-device consumer behaviors and understand how different kinds of content impact those journeys? Tapad and Impact Radius help marketers address this huge challenge. Tapad's Device Graph™ augments the Impact Radius device graph with probabilistic data to identify new devices belonging to high-value consumers. This provides an expanded view of the consumer’s cross-device path to conversion and reveals additional touch points across disparate source types that may have previously been obscured from the marketer’s view. With this solution, marketers gain a richer view of how paid, earned and owned content contributes to conversions. Specifically, marketers can accurately attribute credit to different pieces of conversion-driving content, reward partner contributions, and make data-driven decisions about how to optimize media spend and messaging. Impact Radius has been a longtime leader in helping marketers understand consumer identity across devices. For several years, marketers have been using the Impact Radius device graph to understand how different content types impact impression-based and performance-based marketing initiatives, and how media investments connect to revenue based on cross-device consumer journeys. 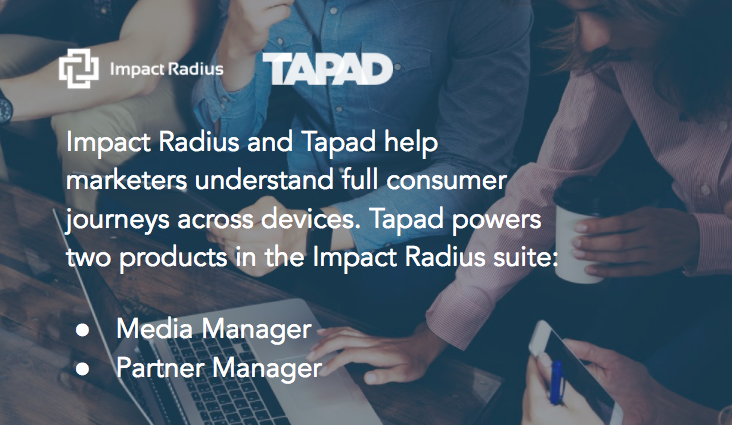 Fueled by the Tapad Device Graph™ — one of the most comprehensive in the industry — Impact Radius enhances the marketer’s view of the consumer even further, particularly in digital environments that rely more on probabilistic than deterministic signals. What’s the result? Marketers gain more precise insights into their partners and consumer journeys. To learn more about our partnership with Impact Radius, take a look at our case study.